Join Illumined Heart co-host Kevin Allen on his pilgrimage to Saint Herman of Alaska Monastery, Platina, California to talk with its Abbot Fr. Gerasim and Fr. Seraphim Rose legacy-keeper and biographer Monk Damascene. September 2nd marks the 25th anniversary of the repose of Fr. Seraphim Rose. In part 1 of this 3 part series, Kevin is in the cell constructed by Fr. Seraphim and now occupied by Monk Damascene where he talks with the monk about his spiritual father. For more information about the books published and distributed by the monastery, visit their website. Inspired by Fr. Thomas Hopko's "55 Maxims" Molly reflects on the practical aspects of prayer when you are at a loss for words. Fr. Seraphim Aldea continues his series on fasting. The Illumined Heart: 119: Why Doesn’t God Answer My Prayer? September 2nd marks the 25th anniversary of the repose of one of the most well known and respected American-born converts to the Eastern Orthodox Church. We know him as Fr. Seraphim Rose, a man many believe will one day be canonized a saint in the Orthodox Church. As a seeker of truth, a prodigious writer and translator, a spiritual struggler, and a monk and priest of the Eastern Orthodox Church, he has influenced countless numbers of seekers and Christians all over the world, through his books, translations and articles. And for this special commemoration, Illumined Heart co-host, Kevin Allen, visited St. Herman of Alaska Monastery, the monastery Fr. Seraphim co-founded in the northern California forest of Platina, California, now under the jurisdiction of the Serbian Orthodox Church. Now we take you directly to Fr. Seraphim Rose’s cell where Kevin Allen conducts his first interview. Kevin:Fr. Damascene, thank you first of all for being my guest on The Illumined Heart radio program. Kevin:It’s a special blessing and honor to me, and hopefully by extension to our listeners, to be conducting this interview on the personal reminiscences that you have on Fr. Seraphim Rose in his actual cell, which is now your actual cell. Just describing it, we’re out in the wilderness. It looks like an old Russian forest, and the cell is about 12 by 10 feet. To use the word “rustic” would not be stretching the word. Kevin:Was this actually hand built by Fr. Seraphim himself? Fr. Damascene:Yes, it was hand built by Fr. Seraphim in 1975, and the wood that was used for the cell was taken from old, abandoned miners’ cabins from about a hundred years earlier. Kevin:It’s a blessing to us to be here. Thank you for having us. Before we begin discussing your first and obviously pivotal and significant meeting with Fr. Seraphim Rose in 1981, just a little bit about your background. You write that you were raised a Christian in the loose sense of the word. Fr. Damascene:Yes, I was raised in and out of Protestant churches growing up. My parents would take me to church sporadically. My best experiences of Christianity growing up and the most meaningful for me were at a YMCA camp near my hometown of Fresno where the Christian faith was imparted to me by the counselors. That was during the early 70s, during the Jesus Movement, when some of these young people were very much on fire with preaching the gospel and so on. So that was my most meaningful experience of Christianity. But in high school, I turned away from Christianity, partly through the influence of a zoology teacher who was very anti-Christian and very pro-evolution. I began to delve into other religions, and I started looking into Eastern religions. I got involved in Zen Buddhism. I was practicing Zazen meditation regularly. I went to Shaseen in Los Angeles Zen Center. Then by the time I was in my first year of college, my foray into Zen Buddhism was really reaching a dead end. I really felt unfulfilled, empty inside, and I was looking for something more. I wanted to return to Christianity, but I didn’t want to return to the Protestant Christianity in which was raised. I found it too superficial, too worldly. It lacked an ancient tradition, a mystical practice and discipline. Then I encountered Orthodoxy in college through a group of students on the campus who had an Orthodox fellowship, most of whom were converts. It was these students who invited Fr. Seraphim Rose to the campus. Among the students in that college student fellowship were Abbot Gerasim, our current Abbot of our monastery, and also Abbot Jonah of the Monastery of St. John in Manton. 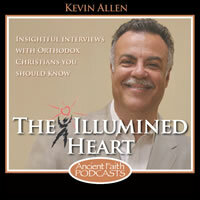 Kevin:You were about nineteen or twenty at that time when you first encountered Orthodoxy and Fr. Seraphim? Kevin:At the University of California Santa Cruz? Kevin:Fr. Seraphim Rose gave two lectures there? Kevin:Do you remember what the lectures were about? Fr. Damascene:Yes, I remember. In fact they have been recorded and published—both of them. The first one was a talk called “Signs of the Coming of the End of the World”, which we have published in the Orthodox World. The second one was called “God’s Revelation to the Human Heart”, which we published as a separate book. Kevin:I’ve read that. In fact my lovely Protestant, evangelical sister-in-law reads that book regularly. It’s been a great joy to her. Were these lectures well-attended? Fr. Damascene:Yes. The talk he gave the first night on the “Signs of the Coming of the End of the World” was a general lecture for a general audience. Of course the Orthodox people on the campus attended, but also Orthodox people from other parts of California came and other non-Orthodox people came for the lecture as well. So the University of California at Santa Cruz Religious Center was filled with people that night. Then the next day he gave a talk for the “World Religions in the U.S.” class, which I was attending. I first encountered Orthodoxy in that class. Kevin:You were a Religious Studies major at that time? Fr. Damascene:I was an undeclared major, but, yes, Religious Studies was my main subject, my main interest. Kevin:So obviously your main motivation was more personal than academic? Kevin:You were searching for something—the connection to the ancient Christian faith, the deeper, more mystical, experiential faith. Fr. Damascene:Yes. I had been attending Orthodox services before meeting Fr. Seraphim. Kevin:Through your interactions with now Fr. Jonah and now Abbot Gerasim? Fr. Damascene:Yes. I would go to church with them, but I was still sitting on the fence. I had not made a final decision to become Orthodox. Kevin:Were you still involved with Zen right then? Were you going to these services and then going back and sitting Zazen, or did that end and you were now searching? Fr. Damascene:I was searching but I still had some baggage left over from the past and still kind of working through some of these things. Before I encountered Orthodoxy, I was thinking that the idea of a personal God was really a lower understanding of God which really came out of people’s holding onto their egos. The highest understanding of the absolute was an impersonal absolute. I was still working through that idea. I had read something in Archimandrite Sophrony’s writings—his book His Life Is Mine—that had a very profound impact on me, that the impersonal concept of deity was actually an expression of the non-being from which we’ve come. The true understanding of God, the highest, fullest understanding of God, is God as person, as I AM. He has revealed himself as I AM. That helped me, but I had still not worked everything through. Secondly, I had not found a spiritual father, somebody that could guide and led me into the faith. I had found peers in college, but I had not found a person I could look up to as a spiritual father. In Fr. Seraphim, I found both things that I was looking for—both a person who had experienced both Eastern religions, even Zen in particular, and also Orthodoxy. He spoke about Eastern religions and Zen as a person who knew about them and as a person who had been on the inside. Of course reading a book had been helpful, but that wasn’t enough. I needed a person. Fr. Seraphim was that person. Also, in Fr. Seraphim, I found that spiritual father that I was looking for. Kevin:So there’s no question but that that was the hand of God—your encounter with him. I want to come back to the impersonal God, because you had a question or questions that you had asked Fr. Seraphim. We want to hear the answer to that. But I do have a question I want to ask first. Did these lectures hit you like a ton of bricks or was it an accumulation process where it started with these lectures where God was leading you and evolved, or were these lectures in your initial encounter with Fr. Seraphim world and life-changing from the get go, so to speak? Fr. Damascene:They were life-changing, pivotal, catalysts for me, but, as I said, it wasn’t as if I didn’t know about Orthodoxy and then suddenly discovered Orthodoxy through the lectures. I had already had some background and attended some services. The one really pivotal experience in my life, of course, was my first attendance of an Orthodox service. I had read some Orthodox books, but it was only in attending the Orthodox service that I sensed the otherworldliness, the ancientness, the antiquity, the mystical reality of the Orthodox Church and its worship. I had had these experiences, but meeting Fr. Seraphim and attending those lectures—it did hit me as a ton of bricks in the sense that at that point I made my final decision to become Orthodox. After meeting Fr. Seraphim, there was no turning back. I knew. In fact, I remember that night after I had attended the first lecture, when I first met him, I remember running to my friend on the campus. He was in the same dorm that I was, and I had met him my first day at Santa Cruz. He was a follower of Yogananda. Fr. Damascene:Yes, Self-Realization Fellowship. He was from a Catholic background. He was practicing the Korea yoga and I was doing my Zen. We were fellow-seekers on the path. We had both come from Christian backgrounds, but we were looking at Eastern religions. I remember that night, after Fr. Seraphim’s lecture, I went to him and said, “This is the man. You have to meet this man.” He never came, and I think he’s still doing that. But I’m saying this because it just recalls what a profound impact [Fr. Seraphim] had on me. Kevin:What was it about him that stood out so much? You mentioned that this was someone for you who knew the insides of some of the areas where you were struggling—the Eastern and the impersonal God. But he was a man, he was flesh and blood, what was it about him that stood out? Fr. Damascene:There were a few things. I wrote about this in Fr. Seraphim’s biography. In fact, many of my references of Fr. Seraphim are in the biography. I just talk in the third person and mention things he told me. Fr. Damascene:His life and works, right. And there’s also the chapter called “Santa Cruz” where I actually go into the first person and describe my first experience of him. A few things struck me. First of all, I sensed that he was—and I don’t think I could articulate this at the time—somehow dead to himself, dead to the world, dead to his ego, he was dying to himself. He was not putting himself forward. He was like a selfless person, a selfless servant. He was only imparting Christ. I remember he was sick at the time. He was sniffling, he was tired, but you had the sense that he was a man who was sacrificing himself, not just because he was sick, but it was the whole impression that he made. He was a man who had totally sacrificed himself for Christ. Kevin:He speaks about that self-emptying in some places too. Fr. Damascene:Yes. I was a spiritual seeker at U.C. Santa Cruz in 1981, so you can imagine that I had already seen many different religious teachers. I had met Sufis, I had met Tibetan Buddhists. But Fr. Seraphim stood out, and also he stood out in terms of Christian people, because there was something very special about him. The second thing I sensed about him was that he had this tremendous wisdom, this piercing discernment that I had never encountered in anyone before. He just kind of cut through everything and gave a clear, insightful answer. He was without any extreme. He was talking about a very volatile subject—the apocalypse—but he wasn’t going to either extreme. Some people were saying “don’t worry about it…it’s never going to happen” or the other extreme was people having this apocalyptic fervor. He was very balanced. But besides that, I sensed that he had this wisdom from God. I sensed that he was very intelligent, very learned, but he wasn’t showing off his intelligence and knowledge. He was very humble, presenting things very clearly and simply for everybody. And I sensed that he was as intelligent as or more intelligent than any college professor I had, but he had this spiritual wisdom that I had never encountered with anyone. Kevin:Do you think he was of genius level mentality? Had it ever been tested? It seems to me, from the reading I’ve done, that this was a very smart man gifted by God with an unusual degree of intelligence. Fr. Damascene:Yes, I definitely say he was a genius. In fact, that was what he was known as in high school. They called him “Eugene the Genius”. In his yearbook someone wrote, “Don’t give Einstein too much competition.” His grades were so far above other students that sometimes he had to be given the only “A” if they were grading on a curve. He was a genius, but the amazing thing about it was that, when he became Orthodox, as he said himself, he said that he crucified his mind. “When I became a Christian,” he said, “I crucified my mind, and all the sorrows that I have borne have only been a source of joy for me. I’ve lost nothing and gained everything.” Especially when he was writing in the Orthodox Word, he wrote his books and articles for everybody. He wrote on a level that everybody could understand, and he really avoided any kind of academic or high-sounding, academic prose. He was…. Fr. Damascene:He was a missionary. Kevin:It seems to me that that’s what comes through, not only with he does, but with everybody at this monastery does, even with your writing. You’re writing about heavy stuff, but it’s to communicate truth to people not to impress anybody with arcane or academic style of writing. Fr. Damascene:Yes, actually at the end of his life, he was very encouraged by the fact that just the common man in America was becoming Orthodox. When he became Orthodox, when he was becoming Orthodox, in the 50s and early 60s, the only converts were intellectuals. They were the ones that kind of penetrated the ethnic barrier and get into there and learn other languages. Kevin:Or seekers like you that were used to dealing with and getting through foreignness to something that was important. Fr. Damascene:A lot of those intellectual converts were just that. They were intellectuals. It was all in the head. So at the end of his life, Fr. Seraphim was very encouraged that it wasn’t just intellectuals. Of course intellectuals are still coming into the faith, but now it was also everybody. He thought that was a very positive development. Kevin:Getting back to what you were saying about the impersonal God, you told us a little about what some of the challenges were that you were dealing with—feeling that perhaps the impersonal God was higher knowledge and so on. You had read something from Archimandrite Sophrony that put that in context. What was it about the concept and the way that Fr. Seraphim explained it that spoke directly to your heart, which is how you have described in your book what happened? What did he say? Fr. Damascene:Well, we actually have it on tape. We’re going to come out with it on the CD, but right now I have it. It’s evident in the writing of Fr. Seraphim’s biography. I said, “Where does this concept of the impersonal God come from?” His answer was as follows: “That concept comes from people who don’t want to meet the personal God.” And once again I want to emphasize that this is very simple—he cuts right straight through it. He could have given me a very verbose, learned answer. Kevin:And that put it all in context. Kevin:Would you say that that broke the spell of the impersonal God after he said that? Fr. Damascene:I can’t say that it was just this one paragraph. It was Fr. Seraphim himself. It was everything together. Kevin:Did Fr. Seraphim actually catechize you? I believe you became Orthodox actually after his repose, no? Fr. Damascene:I was baptized when he was on his deathbed. Kevin:Tell us what that was like. You’ve told us some by just telling us about him, but if there is anything else that you can add to that in terms of how he catechized or the impact of that. Not everyone gets catechized by a Fr. Seraphim Rose. Kevin:I didn’t know that was you. You wrote that one in the third person, didn’t you? Kevin:So that was actually your story. Kevin:As if it was going to be above his head. Fr. Damascene:Then I asked him about Kierkegaard, because I had written a paper on Kierkegaard, and I was ready to discuss this big philosopher like you do in college—this big, deep philosophical discussion with somebody. Of course, Fr. Seraphim knew Kierkegaard, and he knew his philosophy. His only comment about Kierkegaard was, “I always felt sorry for him.” That was it. Kevin:Why was he sorry for him? Fr. Damascene:Well, I knew about Kierkegaard’s life, and I felt sorry for him too. He was a person who was really seeking something deeper in Christianity, but he was in Lutheran Denmark. So he could only go so far. I think he was really unfulfilled. Kevin:He didn’t have the tools. Fr. Damascene:Exactly. But anyway, regarding his catechizing me, one thing I’d like to mention is just an example of when he would ask me questions about my faith and so on and my preparation for baptism. We were sitting in this very cell and he said, “Do you know about the fasts of the Church?” Here I was reading Vladimir Lossky’s Mystical Theology of the Eastern Church, studying about the “divine darkness” and the apothetic theology and all these big things, these very lofty and theological subjects. Fr. Seraphim asks me, “Do you know about the fasts of the Church?” I said, “Well, I know about the Great Lent. I know there’s a fast before the Nativity of Christ. I know there’s some fast about the Dormition before the Mother of God.” He said, “Do you know about the Apostles’ Fast?” I said, “No, I didn’t know about it.” He said, “This is a very important fast of the Church,” and he started explaining why this is an important fast of the Church. He said, “Someone calculated and found that there are more fast days in the year than non-fast days.” He was trying to impress upon me that being an Orthodox Christian means sacrifice. Kevin:Not up in your head. Fr. Damascene:You have to sacrifice. And before you become Orthodox, you need to count the cost. You need to know what’s required of an Orthodox Christian. Kevin:So he was real, maybe as real as anybody you had ever encountered before. Kevin:Truly human, in the sense that we speak of that. Fr. Damascene:Very down to earth. Let’s bring it all down to earth. Kevin:You know, his illness and his death came not very long after you met him at U.C. Santa Cruz. How long actually was it? Fr. Damascene:I met him on May 14th, 1981, and he reposed on September 2nd, 1982. So that would have been a little less than a year and a half. Kevin:Would you say that you knew him fairly well by that point? Fr. Damascene:Well, even Fr. Alexi Young who knew Fr. Seraphim better than most people said that there were many things about Fr. Seraphim that he didn’t know. He was a bit of a mystery in some sense. But I think that, considering the fact that I knew him for about a year and a half, I would say that I knew him fairly well. Every time I would come up here, he was my spiritual father, he was going to be my godfather, and he was the one who was preparing me for baptism. I asked him about himself. I asked him questions about himself. Kevin:And would he talk about himself? Fr. Damascene:Yes. He talked about himself, and, in fact, some of the things he told me about himself are in the book, and they’re not mentioned in the first person, because I was just recording things. For example, I asked him how he became Orthodox. He said, “Well, I was studying Eastern religions and there was somebody at my school who said, ‘You should study the Eastern side of Christianity, the religion you were raised in.’” And that’s how he went to an Orthodox church. I talked to him about classical music, and I said, “Who’s your favorite composer?” He said, “I know Bach is the greatest, but my favorite is Handel.” I wrote a paper called “The Delusion of Self-Deification”, because I was still working through this concept of the impersonal God. In Eastern religions, like in Sufism, they say that you are God, and you just realize your own Godhood. Fr. Damascene:Yes, certain forms of Hinduism. So I was talking with Fr. Seraphim about that. He said that even before becoming Orthodox he had experimented with that idea—not that he was God, but that he was the sole existent reality, called Solipsism I believe. And there are certain letters that he wrote where he brings that idea out. It wasn’t actually something he lived with for a certain amount of time, but I think he kind of considered. Kevin:Didn’t you mention in the book that either he touched insanity or could have? Fr. Damascene:Yes, he was kind of experimenting in that realm. He was trying to break through, because before encountering the truth he was in despair. He was trying to break through to the other side. Kevin:Which is a very Nietzschean way to pursue that which, of course, does lead to insanity and self-deification and self-glorification. Fr. Damascene:Yes, and he was very much involved with the philosophy of Nietzsche. Kevin:Which we will get to in our next interview on his work. So his illness I understand, actually from one of the other brothers here when we were walking around, that he actually was not a well man, that he struggled with various physical illnesses. Is the illness that finally caused his repose—the intestinal problem—did that come on suddenly? Fr. Damascene:It came on suddenly, yes. Now he did tell our former Abbot, Fr. Herman, that when he was younger he had some kind of stomach malady, and he thought he was going to die from it. He prayed to the Mother of God, and he was healed. I don’t know if there was any relationship between that and what eventually took his life. Actually, what occurred was a clotting of blood to the intestines. It wasn’t actually in the intestines itself, and that caused multiple organ failure. And I was here at the time, when he got sick and the whole period of his illness and his repose. Kevin:You were here at the monastery. Fr. Damascene:Yes, right about the time he got sick. I came up here to be baptized by him on the Feast of Dormition. I missed the 1982 summer pilgrimage, because I was in the Holy Land. When I came back, I came to prepare for baptism with Fr. Seraphim. I remember coming to this cell, and Fr. Seraphim was sitting out in front. Fr. Herman would always send me to talk with Fr. Seraphim. So I came here, and I had these questions about the scripture to ask him. It was very hot at that time, and he was sitting out in front. As I was asking these questions, he said, “I’m sorry, I really can’t concentrate now.” He couldn’t answer the questions. Kevin:Which would be unusual for him? Fr. Damascene:At that point, I was concerned. Of course, we became more concerned as days went on. Finally, Fr. Herman told Fr. Seraphim that he had to go to the hospital. Kevin:He wouldn’t have gone on his own? Fr. Damascene:Well, I don’t know what he would have done, but he was resistant at first. He thought he just had some kind of stomach problem and it was going to go away as it had in the past. But it was not a stomach problem. It was a circulation problem. Kevin:Is that something, looking back, that was treatable? Fr. Damascene:Well, I wondered that myself and when I have had doctors come up to the monastery, I’ve asked them about it. The most interesting conversation I had was with a doctor from Finland. I talked with him at length about this and I talked about all the symptoms and what happened. This doctor was very familiar with this particular illness, and it’s very rare. He said that when it occurs—and this is also what the doctors told us when we took Fr. Seraphim to the hospital—the damage is already done before the person goes to the hospital, because it comes on so quickly. This Finnish doctor said he had a girl who was nine years old who had the same problem. He was able to keep her alive for awhile, but eventually she died within a year. Kevin:And he was 48 when he died? Fr. Damascene:Only 48 years old. Kevin:So he was a young man, relatively. Tough question, but can you share what losing such a significant figure in your life was like? Was it a shock? Were you numb? People grieve in different ways. I’m just curious as to what the experience was like. Fr. Damascene:Well, it was a tremendously powerful experience for me. But it wasn’t just grief. It was a whole experience of grace at the same time. I had just been baptized. Fr. Seraphim was supposed to baptize me under a mission, but he was put into the hospital before that. So Fr. Herman went and baptized me up here at Beegum Gorge. Then I went to the hospital. Fr. Seraphim was lying in the hospital bed. He couldn’t talk. He had tubes in his mouth and a respirator. He had tubes in his body too, and he was tied to the bed, because he was convulsing with pain. He saw me coming with my white baptismal robe, and he smiled and he squeezed my hand. Of course, it was very meaningful for me that he recognized me as a baptized Orthodox Christian, and he knew my new name—Damascene. I took the name of St. John Damascene which was connected with St. Herman of Alaska. The Abbot Damascene of Milan was the person who had the first life of St. Herman compiled. He was very close to the monastery, his memory. So he recognized me as an Orthodox Christian. Later, he was buried in my baptismal robe, because he didn’t have a baptismal robe. Kevin:He was buried in your baptismal robe? Kevin:So the last communication with Fr. Seraphim was him squeezing your arm and acknowledging your baptism. Fr. Damascene:Yes, he looked in my eyes and smiled. At some point, because of the medication, his eyes were glazed over, but at that point he was lucid and he could see, clearly looking at me. But it was also very powerful, because, during those days, we would be serving the liturgy in the hospital. It was a Catholic hospital, so we served the liturgy. It was like all the heavens opened up. Everybody was cramped in this little chapel. Everybody sang the liturgy by heart, and then we would give Fr. Seraphim Holy Communion. And I remember,I have a friend who is now a priest in the Orthodox Church (he was also part of that Santa Cruz fellowship, but came a little bit later) who was kind of like me before I met Fr. Seraphim. He thought of becoming Orthodox. He was considering it but hadn’t made a decision yet. He was there when we brought Holy Communion to Fr. Seraphim. They were holding the Gospel above his head, and Fr. Seraphim exerted all the last strength of his body to lift himself. As I said, he was convulsing with pain, but lifted himself up to kiss the Gospel. He would just be lying there with tears streaming down his face. He would be looking up to heaven and praying. It was very moving. People would be standing around the bedside and crying and praying and singing the hymns of the Church. The whole thing was this very powerful experience. We were filled with grief, but it was a common grief. We had each other. Everybody was together. It was not just the people from the monastery. It was all of Fr. Seraphim’s spiritual children who had come from miles around. We had Archbishop Anthony come, Bishop Nektari, so the whole thing was a very powerful experience of grace. Then there was my baptism and receiving Holy Communion every day after that. So it was cataclysmic, but at the same time it was filled with grace. Kevin:And obviously you’ve dedicated a significant part of your life’s work to communicating to the world who Fr. Seraphim was, what he was about, what he taught. So obviously he’s been an extraordinarily significant figure in your life. Clearly so. Fr. Damascene:I can’t think of anybody more significant. Kevin:What was the timeline on deciding to become a monastic? You told us your journey and your conversion experience. Was it then that you started thinking about monasticism, and how long did that take? Where did Fr. Seraphim fit into that decision? Fr. Damascene:Well, after his repose, I was at the monastery for some time after that. Then I had to start school. I transferred to U.C. Berkeley, if you can imagine—being baptized and then thrown into U.C. Berkeley. I went to school there for a year, and I was looking into various life paths. Over the period of that year, monasticism became prominent in my mind. I hadn’t fully made a decision, but at the end of that year I went up to the monastery to write Fr. Seraphim’s biography. So I was going to write Fr. Seraphim’s biography, live in the monastery for the summer and see how it went. Well, the biography was not written until 10 years later, because it turned out to be such a big work. At the end of the summer, some of the monks went up to Alaska to the island where St. Herman lived in order to start a monastery there. I went up with the monks, and at that point I decided to become a novice. Of course, I hadn’t made a final decision to become a monk at that point—it was a trial-test period. But I was made a novice on the Feast of Dormition on Monk’s Lagoon where St. Herman lived in 1983, almost exactly a year after I was baptized. I’ve been in the monastery every since. Kevin:Is the novitiate, being a novice, sort of where you test out your vocation? Kevin:So they don’t hold it against you if you decide during that period that this is not my vocation? Fr. Damascene:Right, and that’s exactly what that period is for. Kevin:I would have to assume that Fr. Seraphim’s influence had something to do with your vocation of monastic life. Kevin:So it started very early, this idea that he was a righteous man, a blessed man, one that could be a canonized saint at some point. Kevin:Would that make Fr. Seraphim, if and when God decides, would that make him the first American-born Orthodox saint, other than Peter the Aleut. But it wasn’t America, as we know it, then. It was still a province of Russia. Bishop Hawaweeny was not born in America. St. John was not born in America. Fr. Damascene:Right. What about Fr. Jacob Medvedev? Was he born in America? Fr. Damascene:It seems to me that I don’t think he was. Kevin:But not many of them, if and when. Fr. Damascene:Also, in the Serbian Church there’s another candidate for canonization, Artemije Radosavljevic, who was an early missionary in America, born in San Francisco. Kevin:Do you personally consider Fr. Seraphim Rose a saint? Kevin:Do you think that he will be canonized? Fr. Damascene:I believe he will because you feel it among the people. That’s how it’s really determined in the Church. The Holy Spirit guides the people in the veneration of a person. Kevin:Maybe as we start to wind toward the end of the interview, you could give us a feel for how canonization happens. It’s a different process than the way Roman Catholics canonize saints, which is very formal and juridical. How does it happen? Fr. Damascene:It’s more organic. The people proclaim him and venerate him as a saint, him or her. The saint starts performing miracles after his repose. His presence is felt, and he is seen to be a heavenly intercessor which confirms the fact that he or she is in the kingdom of heaven. Then the bishops gather together and proclaim what the Church, the people, have already established or confirmed. In canonization, you actually enter the saint’s name in the list of saints. More precisely, the person is entered into the Calendar of Saints. Kevin:So they would eventually put their imprimatur on it, but it’s already been organically recognized as you say. Kevin:It’s not that they decide in a vacuum or that anyone makes a formal petition or application? Kevin:Since we have multi-jurisdictionalism in this country, and that’s another subject of conversation, which one do you think would be most apt to take the lead on it? Would it be the Russian jurisdiction? Fr. Damascene:I think so, because they are the most appropriate. Fr. Seraphim was in the Russian Church, the Russian Orthodox Church Outside of Russia. And now we now that ROCOR is in communion with the Moscow Patriarchate, and Fr. Seraphim has as much veneration in Russia, in fact maybe more so than anywhere else. Fr. Damascene:Now he’s being venerated in Greece. His Life and Works is in Greek, and many people venerate him in Greece. Also in Serbia, they already call him St. Seraphim. In Serbia, it’s more informal than other places. For example, St. Nikolai Velimirović was already called St. Nikolai for many years before he was formally canonized by the Holy Synod of the Serbian Orthodox Church. So they are already calling Fr. Seraphim St. Seraphim there in Serbia. Kevin:You bring this up and I forgot about it. I actually saw at least one, maybe more than one, photograph of Fr. Seraphim on the Holy Mountain, on Mt. Athos—kind of the gold standard of monastic life. So obviously they think highly of him there. Fr. Damascene:It’s really not our place, being the monastery that Fr. Seraphim comes from, to promote him as a saint, to publish icons of him. But if other people do it, that’s fine. Kevin:Fr. Damascene, one of the things you mentioned about canonization and sainthood are the miracles that occur. Are you aware of any such miracles that are attributable to Fr. Seraphim Rose? Fr. Damascene:Yes, there are several. We have accounts of ten different, posthumous miracles, in the last chapter of Fr. Seraphim’s biography, Father Seraphim: His Life and Works, and other miracles have been recounted in past issues of our magazine, The Orthodox Word. Also other miracles have come to our attention since the publication of Fr. Seraphim’s biography. Kevin:Is there one that stands out that you might like to share with us? Fr. Damascene:The more recent one, that hasn’t been published yet in English, comes from Alaska. There was a man in Alaska. His name was Aarom, and he was a Pentecostal. He and his wife had a young son and were very involved with the Pentecostal Church. They knew of St. Innocent’s Academy in Kodiak, Alaska where they lived. They had a casual acquaintance with the dean and the students there, but they really didn’t know much about the Orthodox Church at all and no really direct experience of it. They had no intention of becoming Orthodox. But one day they went to Spruce Island where St. Herman lived in Monk’s Lagoon. They smelled a miraculous fragrance. They heard the monks’ chants. Fr. Damascene:Nobody was there. Our monks were many miles away. They also went to St. Herman’s spring. The lady had a terrible headache, and she drank the water and it just went away. They had these experiences there, and they really didn’t know what to make of them, because it was totally out of keeping with their Pentecostal experience and teaching. Then shortly after that, Aarom had a dream in which he was weeping. There were people from St. Innocent’s Academy around there in the area. There was this prayer shawl. It looked to him like a Hebrew prayer shawl. He used that to wipe his tears away. A man came up to him. He looked like a priest or a monk, and he knew that this prayer shawl belonged to that priest or monk. The priest or monk said to Aarom, “You are to become Orthodox and you are to become a priest.” Aarom said, “I don’t want to become a priest and wear one of those funny hats.” At some point he asked this priest or monk, “What is your name?” He said, “My name is Fr. Seraphim Rose.” He had never heard the name of Fr. Seraphim Rose before. So the next day, he goes to St. Innocent’s Academy, because this dream is such a powerful experience for him, and he talks to the dean. He doesn’t tell him the nature of the dream, because he thought it might seem a bit too weird to the dean. But he asks the dean, “Have you ever heard of somebody named Fr. Seraphim Rose?” The dean said, “Yes, of course.” (The dean is a good friend of ours. He’s been to the monastery many times.) The dean goes to the library and gets a copy of Fr. Seraphim’s biography and his books and shows them to him. The man is totally stunned of course. That began the path for this man to become Orthodox. It was a big struggle for him, because he was very involved in the Pentecostal Church. His struggles were many. But he and his wife kept coming closer and closer to the Church, getting more and more involved, doing daily prayers, started attending an Orthodox parish in the Continental United States, and eventually became Orthodox. Now they are baptized Orthodox Christians and very dedicated members of the Church. Kevin:Is he a priest yet? Fr. Damascene:Not a priest, so we don’t know about that. We have to be careful not to promote that, because we don’t want people to pressure him because of the dream. It’s God’s providence, whatever happens. But he has become Orthodox. There are other cases of people becoming Orthodox through encountering Fr. Seraphim, through a heavenly visitation of Fr. Seraphim—either a dream like that or the sense of Fr. Seraphim drawing them. Kevin:So he hasn’t stopped doing his evangelistic and missionary work. Fr. Damascene:Yes, his life was dedicated to bringing his fellow Americans into the Orthodox Church, and he continues doing that beyond the grave. Kevin:Fr. Damascene, this has been a fascinating interview. Thank you so much for it and for the invitation to come into his cell to conduct it. We’ll continue with the other interviews a little bit later, but thank you very much.